Computer generated animation and design, also called CG, is a very exciting medium that has been growing. Whether you're watching a commercial with an animated character, seeing some kind of TV series that has special effects, or you're watching a full-length animated feature that has those awesome 3D characters that clearly aren't real, but they are 3D and toonish looking, it's all CG! It's also much more available to everyone than you might think. A question in many people's minds, if they want to pursue a dream of making these CG creations, might be: how can I possibly afford to do this sort of artwork? The software is expensive, and it's hard to learn. Well, fortunately here at shembol.com, we have answers to both of those concerns. While much of the software comes with a rather large price tag, there is one that has the most easy to deal with price tag you could get: FREE! What software is this? 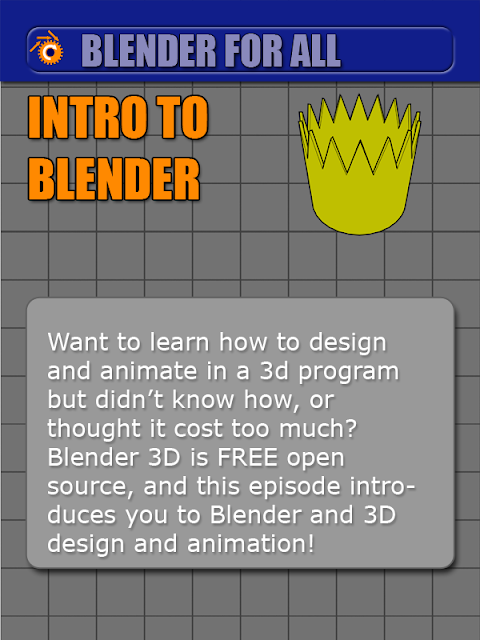 As mentioned in the title of this article, this software is called Blender. Blender brings the awesome power of the CG media to the masses. This software allows creation of architectural visualizations, adding special effects to existing footage, character animation, and even doing 3D printing. How cool is that? This software is amazing, and all this comes free, with absolutely no strings attached. Now the next question becomes: All right, now I have the software, but how do I use it? At shembol.com, we have now begun a video tutorial series on using Blender called 'Blender for All', and this series explains how to use this software, and this is the first video of the series, called 'Intro to Blender'. In this video, we'll be going through how to model a crown in Blender, and then we'll set up a very simple material for the crown. This tutorial is for the absolute beginner as a quick start to overcoming the learning curve of Blender, giving a basic overview of how to use some of the most commonly used commands in Blender. So, without further ado, here is our video!